2017 was our 8th year of running trips to the island and each year we are as excited as ever to get underway. 2016 was a superb year for both big females and numbers of sharks…how would 2017 compare? Regular trips ran from mid September to mid November, private charters ran from mid November to December then the season was rounded off by spending 10 days at the island filming for Discovery channel. Running directly out of Ensenada this year saw a slight change to our trip itinerary. The schedule is now much smoother for our guests we now board a coach from San Diego and meet the vessel in Ensenada where we then depart to the island. The same for the return journey, this change in travel cuts down on time spent travelling at sea and is much more pleasant for our guests. This year also saw a new Captain at the helm – Ryan (one of our head crew from last year) stepped up and did a fine job heading up the operations and bringing his passion for the ocean and its marine life to the team. Completing the crew this year was Ken (also returning from last year) and newcomers Alex, Steve and Fernando. The season began in typical fashion. Hot weather and very high numbers of sharks. In September and early October we where seeing between 20 – 30 sharks per trip! The average was equalling last year numbers, the only difference was that it was the quietest year we have had seeing the big females. October came and went and as we passed into November, still no sightings of a “mega shark.” It was only during The Shark Research Committees’ private charter on the final day that we caught a glimpse of one, but sadly, where unable to Identify her this time. Throughout the season we where visited by many of our teams favourite sharks. Newbies such as “Slashfin”, “Donna”, “Cosma”, “Sad Face”, “Apollo Orion” and “Axel” regularly made appearances each month. Sharks that are regulars in recent years such as “Johnny”, “Paul Walker”, “Drogin”, “Geoff”, “Andy”, “Monkey” and “Kenric” all continued to make growing names for themselves as well as “Luca Arnone” who retuned this year without the entanglement of rope that he had tied around him last season. It was great to see him again in good health. As far as the “classic” Guadalupe sharks – “Bruce” was spotted earlier in the season by another operator making this year his 16th season seen at the island! Sadly we missed him but we did spot another famous big male, “Bite Face” who also makes 2017 his 16th returning year! Incredible. Around mid October we had a fantastic trip spent in the company of “Stella”. Not quite a mega shark yet but she is a good 15-16ft in length. Another big shark seen this year was the aptly named “Thor”. He has been around a while now and like “Stella” is fast becoming one of the islands bigger animals. This year was definitely the quietest for the mega sharks. Perhaps most of them arrived later than usual and we just missed them this time but we did see one 17 ft female briefly on the final day of the regular season giving us a great finale plus, in December (during filming with Discovery) we saw the gigantic 16-17 ft “Gianna”. She is one of our teams’ favourites and we even managed to film her for the upcoming show due to be aired for this years shark week. Keep an eye out for her. The two sharks that where the king and queen of the season has to go to “The Legend” and “Screaming Mimi”. 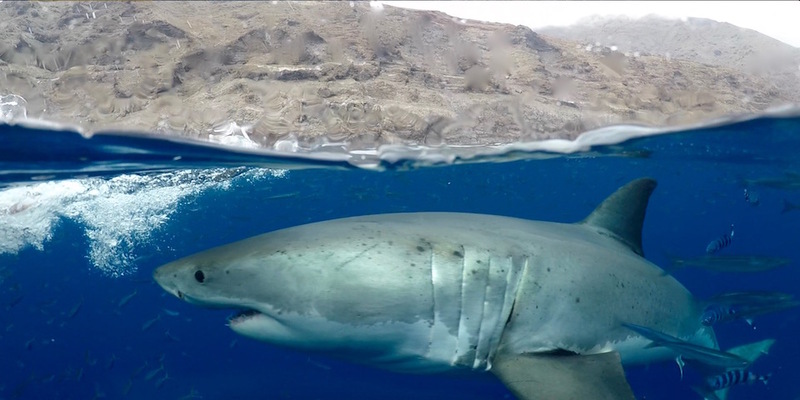 “The Legend” is fast becoming one of Guadalupe islands’ classic sharks. We first saw him a few years back and his showmanship around the boat and cages made him an instant star! He is around 13ft in length but growing up fast and if he continues in futures years like he has done in the past couple, he will certainly grow into his name! “Screaming Mimi” is another shark that has grown big…..and fast! We first saw her last year and in that time she has grown another 4ft in length. Now around the same size as “The Legend”, she spends less time around the cages as him but….when she does turn up she makes up for lost time. Often lunging on the baits and completely breaching clear of the water, she can make our divers in the water dizzy trying to keep up with her! Both these animals where true stars of 2017 and we hope they make a return this coming 2018 season.